We're staunch advocates of network-attached storage solutions here at HEXUS, and having frequently extolled the virtues of centralised data in the home, we're now giving you the chance to win an award-winning Synology DS414j! Valued at £270, this sleek-looking four-bay box features a dual-core CPU and SuperSpeed USB 3.0 connectivity. Delivering average read and write speeds of 112MB/s and 80MB/s, respectively, it's an ideal solution for home or office environments and comes fully equipped with the latest version of the highly-respected Synology DiskStation Manager operating system. Hint: In case you missed it, you can find the correct answer at synology.com. The prize draw is open to HEXUS readers globally aged 12 years or over. The competition winner will be picked at random from all eligible entries that arrive by midnight of the closing date, September 4, 2014. The winners will be notified via email by September 11, 2014. The winner must claim their prize within 7 days of the promoter sending notification. If the prize is unclaimed after this time, HEXUS reserves the right to offer the unclaimed prize to a substitute winner selected in accordance with these rules. 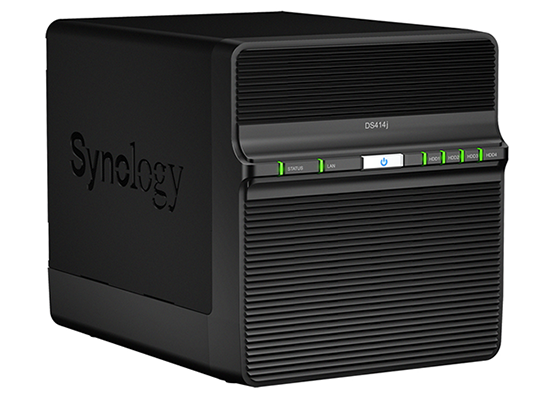 The prize is a diskless Synology DS414j NAS. Intel Optane DC persistent memory starts at $6.57 per GB Gigabyte Aorus RGB AIC NVMe SSDs listed HEXUS Week In Review: GeForce GTX 1660 Ti analysed Synology DS1019+ QOTW: Do you own a NAS device? Problem with this comp, it asks for an answer but there is no where to choose an answer. You don't see the radio buttons denoting the answers? I do now, but it wasn't there before I can assure you. Wish I had taken a screenshot so I dont look like I am losing my mind! Thank you for flagging - I can see it.